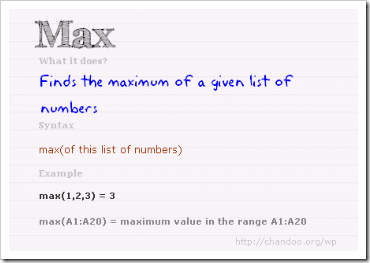 Chandoo on the Pointy Haired Dilbert blog [^] has launched an excel formula helper [^]. The aim is to provide normal users of Excel with an easy to understand English explanations, and examples, of some of the most commonly used Excel formulas. I am a professional Excel-wrangler, and occasionally I have to resort to using Excel Help, and it is never a pleasant experience. And, for the most part I know what I’m looking for / at, so what’s it like for “normal” people. I am also a point of contact for some of less experienced Excel users around the office. Usually it’s for formula help, “how do you …” and “why doesn’t this work?” type problems. It’s nice to know that I now have a resource that I can point others to so that they can help themselves or if I’m too busy to explain a formula. Chandoo has promised that if this popular then he will expand this initial offering, so help everyone and point people there.